This Sunday is about fish. More specifically, the Anchovy. Dreaded by some, enjoyed by others. I'm firmly in the "enjoy" category. I happen to love them. I like them on pizza, but I really like to cook with them. Melted into sauces they add a salty piquancy. Sautéed with garlic and mashed you can add in a bunch of fresh-chopped heirloom tomatoes and basil and toss with Penne and a liberal dose of Reggiano or they can liven up a cream sauce for the best Alfredo you've ever had. Even the oil they're packed in can be used (a teaspoon at a time) to make the best salad dressing ever. The secret? Don't ever tell the phobic it's in there. Not that I would tell you to do this to people who have seafood allergies or are vegetarians. That would be wrong, because there are people who have been scarred by being faced with a pizza with a mass of spiny fish corpses half-cremated into a surface of cheap cheese that should be jailed for pretending to be Mozzarella. There are also substitutes for the actual fish. Anchovy paste is readily available and is perfect for adding a bit of rich roundness to dishes ranging from stews to salad dressings. 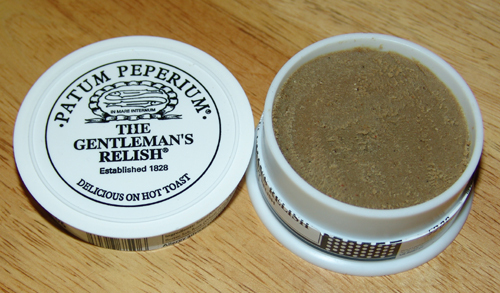 One of my favorites is the (now with naughty connotations) Gentleman's Relish, which mixes butter and spices. It's actually a great thing to have in the icebox: as an evening snack a small schmeer on a wheat thin or two has kept me from inhaling the Häagen-Dazs more that once. What say you? Loathe or love? Yes, anchovies ... yummy. They certainly do add an extra rich dimension to casseroles, roast lamb etc. And I have a lovely biscuit recipe which is so easy - just butter, flour, anchovies and parmesan. You keep the mixture rolled up in the freezer and slice discs off the cylinder when you want to bake them. Really tasty and anchovy haters seem to like them. I think I could be tempted to eat them every day. I wonder if the taste has anything to do with the Japanese concept of "umami"? Adore. Period. End of story. Where do i find this... ahem...Gentlemen's relish? A fan to be sure as one of my favorite snacks with tea is anchovy toast (Vegamite is the other go to toast option). Will put Gentleman's Relish on the to try list. Funny that the anchovy lovers are ahead in the comment section, but I've always thought perfumistas are a sophisticated bunch. Amazon has it. Plus other places. You can also make it. I haven't had Vegemite in years! Olivia Newton-John had an Aussie-themed shop on Melrose called Koala Blue that had it. I too love the piquant, salty mini fish! I will try your ideas. Are you amenable to parting with the biscuit recipe? Put all ingredients except Parmesan in food processor and mix till it forms a dough. Make this into 2 balls and form into cylinders about 4cm in diamter. Wrap each roll in cling film and put in freezer. When ready, preheat oven to 180c. Take frozen roll from freezer and with a sharp knife slice off as many discs as you need as thinly as possible, and place on tray (replace roll in freezer). I find that it helps to let the roll thaw a little before slicing. Sprinkle generously with parmesan and put in oven for 7-8 minutes until lightly browned. Absolutely love and adore anchoves. Love anchovies. Will stuff them in green olives, eat with butter on toast (Yes, staves off Hagen Dasz excesses), I even tried to make a savory cookie with them. (Anchovy biscuits are a better idea). YUM! @Jillie...Made your Anchovy Biscuits today, and they are wonderful! Just the thing to keep in the freezer now that holiday time is almost on us. Thank you for the recipe. Dear Vinery - I am so pleased! This mixture certainly makes lots of them and they are so useful and delicious. Happy eating/holidays. Thanks! Can you substitute anchovy paste for fillets? love the idea of anchovy stuffed olives. makes me want a martini! Hi! Yes, I would happily substitute for anchovy paste - I've done that when making Piedmont Peppers (stuffed peppers with tomatoes and garlic). I'd run out of the fillets, so improvised with anchovy sauce and they were just as nice. The paste and sauce are much more economical too.